A client recently expressed frustration that “markets don’t seem to be working.” While it is always difficult to discuss investment returns that fall short of expectations, the reality is that equity markets have been through the roughest patch seen in decades, and as a result, the premise of risk and expected return needs a fresh review. Despite the massive rally witnessed in 2009, the S&P/TSX has fallen by 21% since peaking in June 2008, and the Dow Jones is down 28% from its peak in 2007. While Leon Frazer portfolios have generally fared better than the market indices, nonetheless, we have also experienced periods of negative returns over the past two years. This runs counter to investor expectations developed since 1982, where all asset classes did exceptionally well as interest rates fell from their peak. The meltdown of 2008 reintroduced risk in a way that few expected, and dramatically changed the uptrend the equity markets have experienced for nearly three decades. 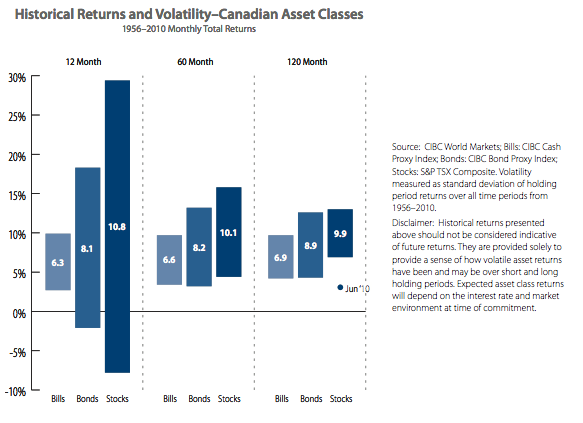 The following chart provides a historical review of asset class returns and volatility since 1956. The results offer an interesting perspective on what is happening today.